Did Kanye West Jinx the Nike vs. Adidas Stock Debate? The sports apparel industry is incredibly competitive. Both fashion trends and sports-star followings can change on a dime, providing upside resistance to industry players. Nevertheless, Nike Inc (NYSE:NKE) and Adidas AG/S ADR (OTCMKTS:ADDYY) have generally performed well this year. Even upstart rival Under Armour Inc (NYSE:UA) is off to a promising start. But in the ongoing Nike vs. Adidas battle, which one stands out? On a surface level, analysts likely give NKE stock the advantage. Yes, its corporate shares are up 10.7% on a year-to-date basis, which is notably behind Adidas (the German multinational firm is up 16.5%). However, Adidas has incurred a worrying drop since April 18, with its market value falling more than 12%. In sharp contrast, NKE has maintained a steady rise forward, befitting its blue-chip status. But the biggest twist to the Nike vs. Adidas storyline is Kanye West. Recently, the both famous and infamous rapper made what many social critics claimed were incendiary remarks about slavery. His original statement suggested that African-Americans were willing participants in their oppression. West later clarified that African-Americans were “mentally enslaved” and that he wanted to avoid “another 400 years” of slavery. Adding to the fire is the rapper’s professed “love” for President Trump. As a result, several African-Americans took exception with West’s remarks. But what does this have to do with the Nike vs. Adidas battle? Very simply, Adidas distributes West’s popular Yeezy shoes. After West’s remarks found their way into the blogosphere, many felt that Adidas should cut ties with the controversial rapper. Instead, the company’s CEO, Kasper Rorsted, did a very un-Trump like thing. Rorsted punted, and essentially prayed that the issue would go away. It didn’t, and it hurt ADDYY stock “bigly”. Is There a Clear-Cut Winner in Nike vs. Adidas? From an investment perspective, the biggest controversy for ADDYY is that the West drama overshadowed its recent earnings report. Accounting for foreign-currency fluctuations, the athletic apparel maker increased first-quarter revenues by 10%. The highlight of that sales haul is that the vital North American market saw 21% growth. Although NKE is the dominant player in terms of total annual revenue, the American icon has recently struggled to gain traction with its own customers. It’s the same story with Under Armour, which has famous, homegrown athletes like Tom Brady on its payroll. Thus, it’s a slap in the face when the German juggernaut enjoys a multi-year boost in sales. That said, some analysts have pointed out that growth magnitude declined in Q1, suggesting a sales peak. Moreover, consumer data trends may point to a declined emphasis in fashion, and an increased emphasis on performance. This favors Nike, and by logical deduction, NKE stock. So, does the Nike vs. Adidas boxing match have a clear, undisputed winner? Not quite. While I’m not going to dispute the previously mentioned consumer trends data, I will say this: the American consumer can be incredibly fickle. Let me also point out that Rorsted was unwilling to part ties with West. If the North American market was truly shifting towards performance-based athletic products, wouldn’t firing West be simple and logical? But there’s nothing easy about Yeezy — it’s clearly a moneymaker. That’s why Rorsted, in this politically charged and divisive time, stuck with the controversial rapper. Furthermore, in the trailing decade, sales growth for NKE and ADDYY are neck-and-neck. 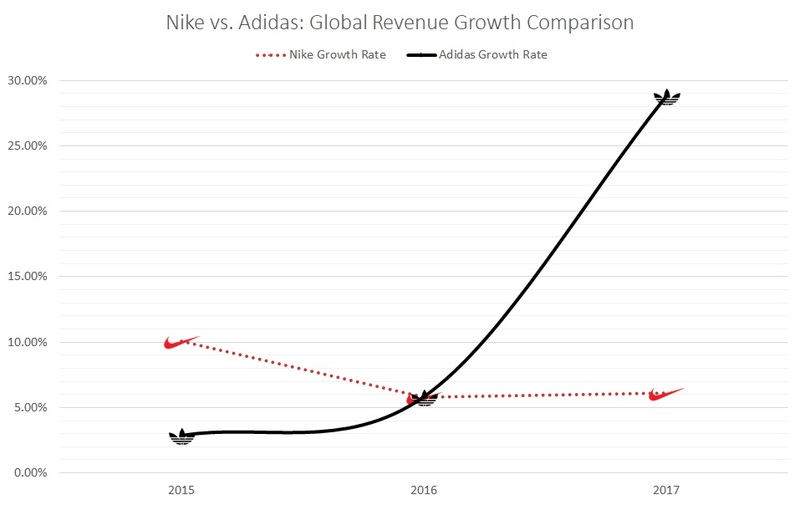 But in the past three years, Nike’s growth slipped to 7%. Adidas? Try 13.5%, or nearly double the American giant. I might take some heat for this, but I don’t think Kanye West’s comments are as outrageous as they’re portrayed. West has the First Amendment right to express his opinions, and let’s be honest: he’s popular in large part because he takes advantage of that right in his music and art. Plus, he’s making a comment about his community and the experiences that he lived as a member of that community. The real outrage is that people assume that specific American communities should only think in a singular manner. West’s sole crime is that his opinions offended mainstream society. Thankfully, mere offensiveness is not an arbiter in determining the First Amendment’s validity. I’m reminded that, several years ago, NFL running back Adrian Peterson compared pro football to slavery. Many people were outraged, but eventually, the controversy faded. Peterson has the right to make those remarks, and he’ll be remembered as one of the game’s all-time greats. On the flip side, having a star on your payroll make controversial remarks is a liability. But for Adidas, West’s comments were just that, controversial. They weren’t mean-spirited or directed at anyone in particular. Thus, I consider ADDYY shares falling as a contrarian buying opportunity. Ultimately, in the Nike vs. Adidas battle, I love both competitors. However, with Adidas suffering extra-curricular troubles, I give the edge to ADDYY. NKE is doing what it’s supposed to do. Its rival, on the other hand, is being undeservedly punished. If you can stomach the nearer-term volatility, I’d buy Adidas. The post Did Kanye West Jinx the Nike vs. Adidas Stock Debate? appeared first on InvestorPlace.